I have been reading Piecework, which is an American quarterly magazine. It isn’t the ususal sort of craft magaizine in that, although there are projects to complete, these are inspired by the historical objects which form the subjects of the accompanying articles. It struck me that most of the writers refer to their family – mothers, grandmothers, even the odd grandfather – the people who taught them how to knit, sew and generally inspired them, which then led me to think about my own family and how they have influenced me. It is also the 100th anniversay of WW1 and I have somehow inherited a number of “war bits”, mainly from my paternal grandmother. Having decided to excavate one of the bedroom cupboards last weekend, I rediscovered a tablecloth she made from the centre of a WW2 parachute. I have no idea whether it is German or British. I just know it is a parachute and she crocheted a lace edging for it. She also said she and the other women in the neighbourhood used the rest of the parachute silk to make underwear. I can confirm that I do not possess any of my grandma’s knickers. My mum was always knitting. She did some dressmaking too; most of our clothes were home made when I was an infant and I remember being particularly proud of a cotton summer dress with blue roses on it which I wore to the church fete when I was about 3 or 4 (I think I was a flower girl to the fete queen). Mum could crochet and tat too; there were a few embroidered objects floating around our home which she had completed years before, but yarn was the main thing and, like me, she preferred stuff to be complicated. She found acres of stocking stitch a total bore. And then there was Mrs Watson. 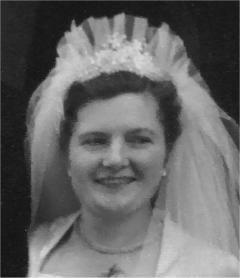 She was not related to me in any way whatsoever but I always regarded her as a sort of surrogate grandmother and I loved her dearly. My sister and I used to go to her house every Saturday morning where, from 10 until 12, we would crochet, sew, knit, talk, drink milky cofee and eat the world’s best home-made scones. Mrs Watson, or Rhoda to her friends, is the person who taught me most about handicrafts. She was quite old fashioned in her outlook – very proper and a true blue Tory. She always wore boned corsets, which meant that giving her a hug was a strange experience as no one else I knew even had such a thing. My grandmother had certainly abandoned them. I can’t remember hugging Grandma and feeling a sort of chain mail barrier between us. Mrs Watson died in 1988. She had no grandchildren of her own and her daughter had died from multiple schlerosis a few years earlier, so I don’t suppose there are now many people left who remember her. But I do and this post is my way of remembering her and all who blessed me with the gift of craft. Steeks – I finally did it!